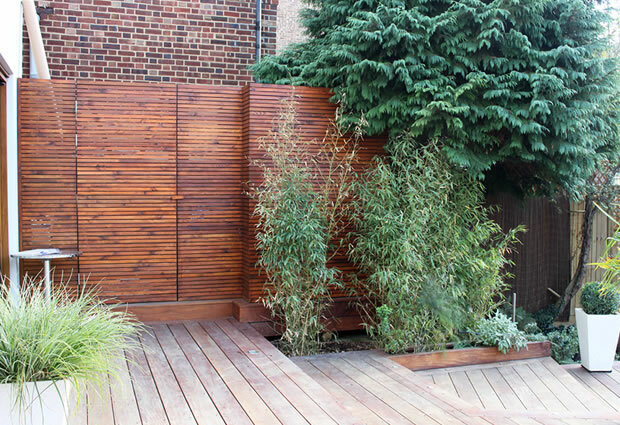 Sometimes you simply have to let the materials to the talking, and there is no better than an Ipe hardwood used for this garden design Wimbledon SW19. 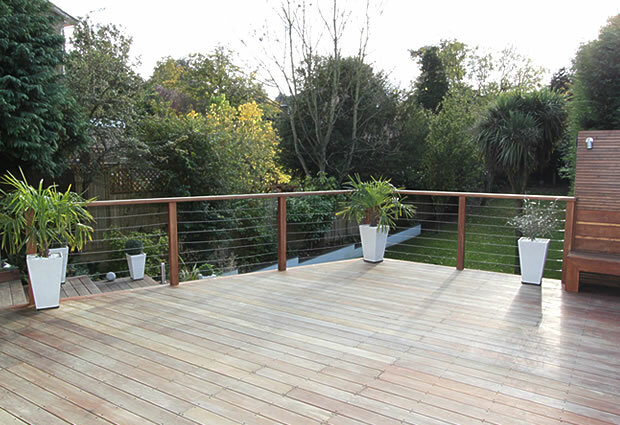 Also know as Brazilian Walnut, its great for outdoor applications especially decking. Not only beautiful in grain, it is a very dense timber and therefore very durable.Easily maintained and gradually over time will “silver “. This is a term used for timber greying due to UV sunlight . If you wish to keep the colour of the timber you can use oils with UV filters and this slows down the process. Taking the timber back to its natural four can be done bay sanding back and et true process happen again enjoying all the colour changes along the way. Its versatile and ever changing. 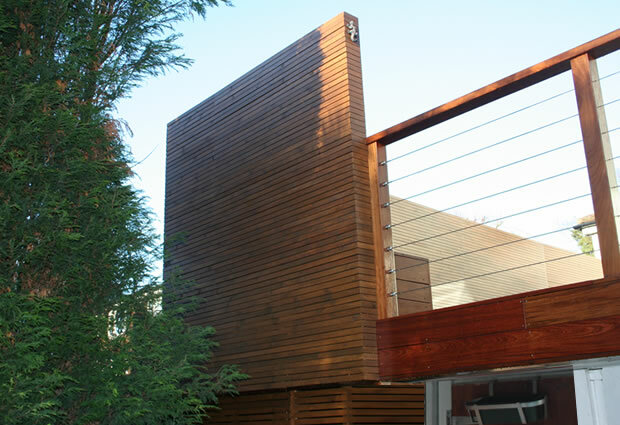 The garden design hangs on the large hardwood terrace , has a bespoke in built seat as dinning and lounging area, framed by the red cedar contemporary venetian style fencing, as is most of the terrace. We also built a matching gate for seamless continuity. With this garden design in Wimbledon it’s not all about about the terrace. The lovely secluded lower garden had a special feel and I wanted to see the lower garden and terrace working holistically. I also wanted the terrace to have a presence from below and to have a real visual presence . 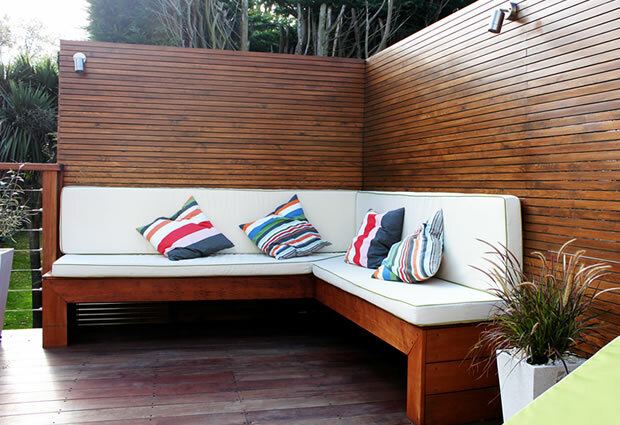 I extended and worked with the upper fence creating a monolithic back drop to the seating area giving that effect, creating visual interest and giving that strong architectural presence to the upper terrace. maybe i had just watch a space Odessy 2000! 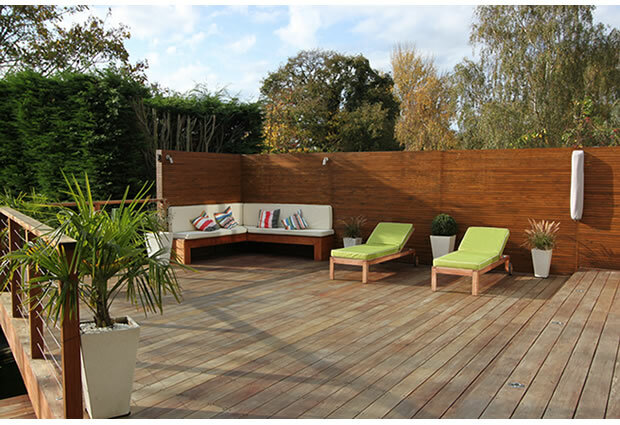 Creating the large terrace really came about through the idea of a viewing platform. 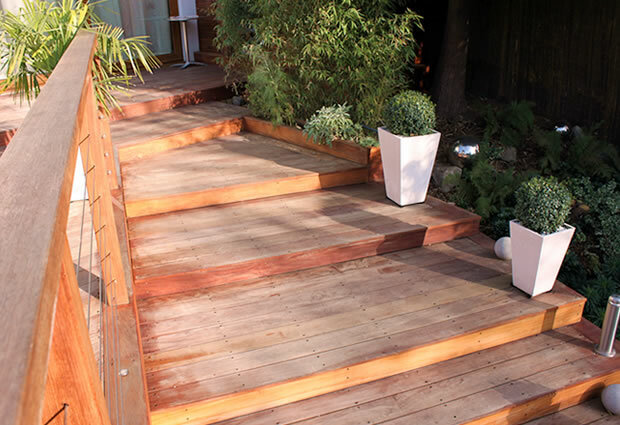 The wide generous staircase leads the way.Stairs are often neglected and i think area such an important feature in a garden, and can transform a garden single handedly. 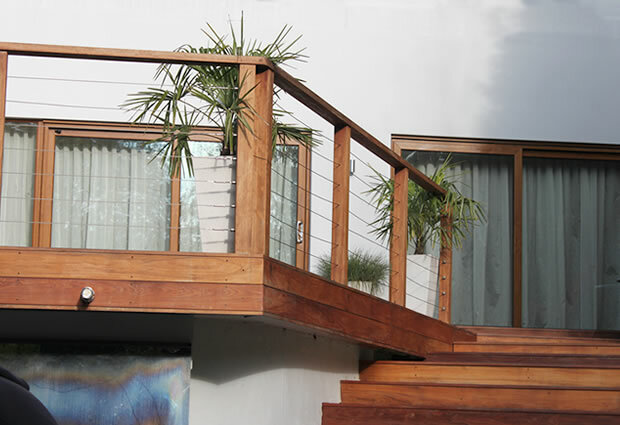 The bespoke designed and built Ipe and stainless steel balustrade bring clean lines and a welcoming embrace. Many other examples of our garden designs can be viewed our portfolio page.They cover a wide range of bespoke garden design. We take each project on its own merits and work closely with the clients ideas and requirements. Whatever your garden design needs or requirements .whether oudoor room , roof terrace, small family garden , contemporaray garden , formal courtyard etc . 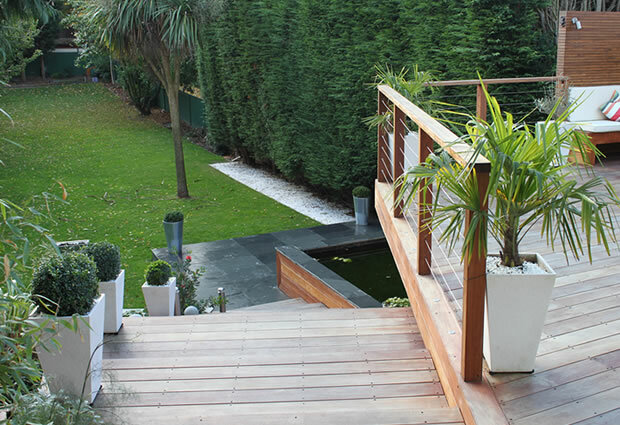 The London Landscaping Company can help and assist you with your project . So please feel free to get in touch for a free consultation and site visit with Billy head of creative and owner of London Landscaping , and or one of our very experienced and friendly professional garden designers or horticulturist We can help you to realise your project and explain the process from initial concept , through to design and build .